GBPUSD is under the influence of oil dynamics at the moment. UK is not releasing any specific news factors and reports today. 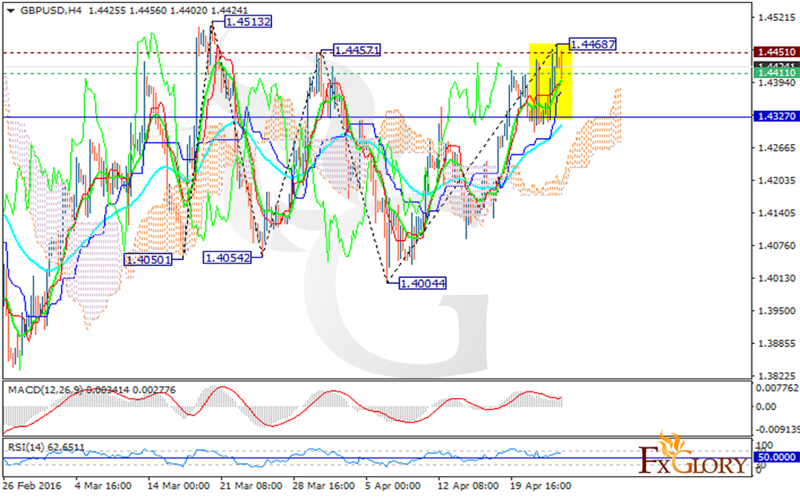 After reaching 1.40044 the pair has been moving with bullish bias. The EMA of 10 is above the EMA of 50 which shows the price growth over the last recent days. The support lies at 1.44110 with resistance at 1.44510 which both lines are above the weekly pivot point at 1.43270. There is a strong buy signal with the Ichimoku indicator. The price is above the Ichimoku Cloud and the Chinkou Span. The Tenkan-sen and the Kijun-sen are showing upward trend. According to the MACD indicator which is in positive territory, the price is increasing. The RSI is above 50 level confirming the same scenario. Long positions are recommended with the target at 1.4480.